Continued refinery shutdowns for planned maintenance resulted in lower crude oil receipts and refinery production in May compared with the same month in 2017. This was the second consecutive month of sharp decline in crude oil receipts and refinery production. 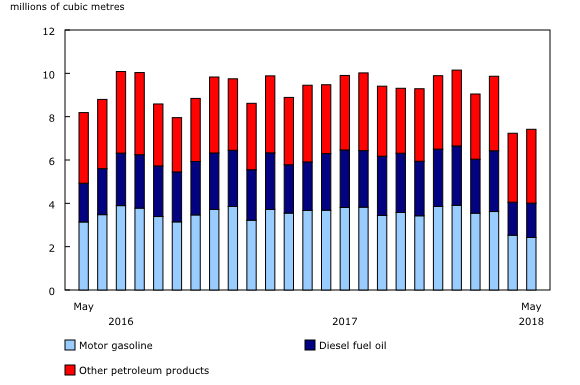 Canadian refineries received 7.3 million cubic metres of crude oil in May, down 15.6% from the same month a year earlier. Imports of crude oil to refineries were down 19.9% from May 2017 to 2.7 million cubic metres. Domestic crude oil received by refineries declined 12.8% to 4.6 million cubic metres. Crude oil inventories held at refineries totalled 3.2 million cubic metres in May, up 8.6% from the same month in 2017. Total crude oil and equivalent products used in refinery production decreased 23.2% year over year to 6.5 million cubic metres in May. Production of refined petroleum products was down 21.5% year over year to 7.4 million cubic metres in May. Planned refinery shutdowns for maintenance contributed to the lower production in May. Meanwhile, domestic sales increased 5.4% to 9.4 million cubic metres. 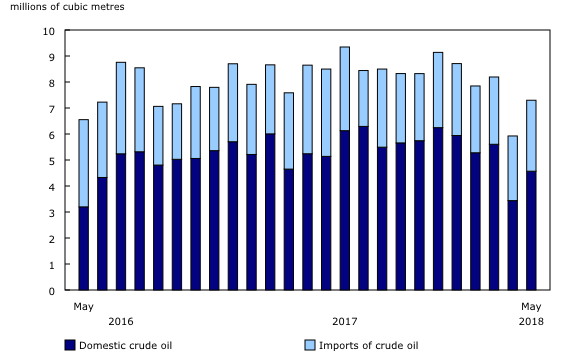 In May, Canadian imports of refined petroleum products rose 34.9% from the same month a year earlier to 2.1 million cubic metres. The increase in imports was attributable to lower refinery production. Meanwhile, exports of refined petroleum products declined 13.5% to 2.2 million cubic metres. Closing inventories of refined petroleum products held by refineries increased 0.8% year over year to 7.3 million cubic metres in May. Data from January 2014 to April 2018 have been revised.